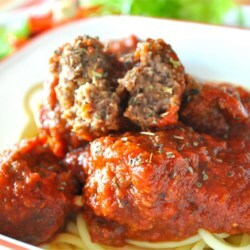 My kids was served this with Nana's Pasta sauce by EAKE, and my son said it was better then Subway's meatball sub. WOW, is what I thought. 3 of my kids had 2 hot dog size meatball subs a piece. And I tried the meatballs myself and thought it was delicious by slightly on the salty side, I think I would omit the salt the next time I make these(for my prefences) It had such a wonderful aroma of flavors. I really enjoyed it. However, my kids said it was slightly spice on some crunchy pieces but I guess that means the red pepper flakes. But all agreed it was loved. I think possibly use cayenne powder in the place of the red pepper flakes just for them. But I saw no problems with the red pepper flakes....but I have to apease to the children. I will so keep this recipe in my box, because not only was it good, it's the 1st meatball I've ever made that was cooked all the way through and moist, not hard or stiff. Thanks lovetohost.